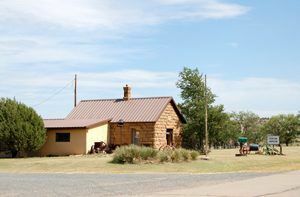 Situated on the Dry Cimarron Scenic Byway in the Oklahoma Panhandle is the very small town of Kenton, dating back to the late 19th Century. Long before there were any towns in this area, the region was utilized by nomadic Indian tribes for hunting. Later, it became the property of Spain, then Mexico, and later the United States, but, was not part of Oklahoma or what was then Indian Territory. Thus, the area became known as “No Man’s Land”. The Cimarron Cutoff of the Santa Fe Trail passed through the Panhandle when it was established in 1826 and travel through the area substantially increased after gold was discovered in California in 1849. Afterward the cattlemen began moving into the area, which had been declared public domain. Because it was under no jurisdiction, in also came a number of outlaws, including the notorious “Captain” William Coe in about 1864. Located strategically on a long high ridge jutting southwest from a large mesa near where Kenton would later be established, Coe built a “fortress” to protect himself and his gang of some 30 to 50 members, who primarily rustled cattle, horses, sheep, and mules. For several years, these men earned their livelihood raiding ranches and military installations from Fort Union, New Mexico to the south, Taos, New Mexico to the west, and as far north as Denver, Colorado. They also preyed on freight caravans traveling along the Santa Fe Trail, as well as area ranches. Hiding the stock in a canyon some five miles northwest of their hide-out, the rustlers built a fully equipped blacksmith shop, which contained all the tools necessary to maintain the herds, as well as changing the brands. When all hint of the previous owners were removed, the desperado cowboys then moved the herds into Kansas to sell. 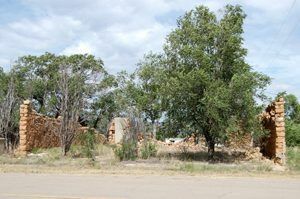 Building ruins in Kenton, Oklahoma, 2008. Though they had been getting away with their lawlessness for several years, the gang made a major mistake when they raided a large sheep ranch in Las Vegas, New Mexico in 1867, killing two men before making off with the herd to Pueblo, Colorado. Though wanted before, these murders put Coe and his men on the “wanted list” like never before and soon, the U.S. Army from Fort Lyon, Colorado were pursuing them. He would eventually be captured and hanged by a vigilante mob. Up until 1890, there were no schools in what would become Cimarron County and only two communities and post offices — in Mineral City, which claimed 98 inhabitants, and the other in Carrizo, which boasted some 83 people. Carrizo was established about a mile west of where Kenton would later be established. 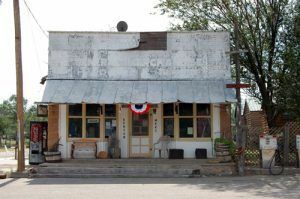 The boisterous little cowboy town was comprised of a general store and three saloons. A post office was established here on September 8, 1886. 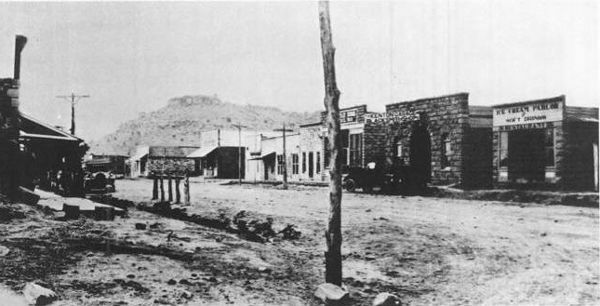 After the Panhandle was surveyed and organized, the store owner moved his store from Carrizo about one mile eastward and laid out 40 acres for a new townsite. Before long the saloons also moved, leaving nothing behind in what was Carrizo. The town was first called Florence, with a post office opening on April 19, 1890. This would last only for about a year, before it was renamed Kenton on May 12, 1891. Being the only town for miles, Kenton soon grew to a population of about 350 people. In 1905, Kenton boasted three general merchandise stores, a drug store, hardware store, furniture store, shoe shop, barber shop, blacksmith, livery, grain dealer, a seed mill, laundry, two saloons and a church; as well as many homes built of brick, stone, frame, and adobe. Cimarron County was formed soon after Oklahoma obtained statehood in 1907 and Kenton was named the temporary county seat. However, a county seat election was held on June 11, 1908 and Boise City won the election. A Boise City contingent soon confiscated the county seat papers, prior to the end of the mandatory 30-day waiting period, creating a controversy and a local legend that Boise City stole the courthouse. During Kenton’s early years, it boasted two newspapers — the Cimarron Valley News and Cimarron News. It would also later support two car dealerships, a motel, and a bank. The North side of Main Street in Kenton, Oklahoma, 1916. Agriculture and cattle ranching was and still is the economic base of Kenton and Cimarron County. During the first decade of the 20th century the Panhandle held the highest population ever recorded in any census. Those old settlers who had squatted and stayed on uncertain lands some twenty years before finally enjoyed vindication of their faith in themselves and the land. The first two decades of the twentieth century were generally good years for the people of No Man’s Land. In 1925, the Elkhart and Santa Fe Railway completed a line from Elkhart, Kansas, into the county and on into New Mexico in 1932. 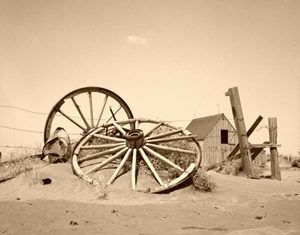 An abandoned farm in Cimarron County, Oklahoma during the dust bowl days of the 1930’s. Prosperity for Kenton and Cimarron County would change in the 1930’s when drought and fierce winds eroded the exhausted soil and created fearsome dust storms that were so bad at times, it blotted out the sun. Though much of the southern Plains was hit hard during the days of the “Dirty 30’s”, the Oklahoma Panhandle was one of the most devastated. The region once more reverted into a type of “No Man’s Land” as farmers and ranchers fled the area in search of a better future. Railroad service was discontinued in 1942 and more and more people moved away over the next decades. Though very sparsely populated today, this area is rich in history and has its own rugged type of beauty. Black Mesa State Park is located about ten miles southeast of Kenton. The mesa itself is located just north of Kenton. It reaches some 500 feet above the valley and has an overall elevation of 4,973 feet, making it the highest point in Oklahoma. The Black Mesa plateau is hailed as a geological marvel. Some 18 tons of dinosaur bones have been quarried from the region. Bird-lovers, naturalists, and outdoor enthusiasts share the space with the hundreds of hunters who come here for the antelope, quail, and mule deer. Traces of the Santa Fe Trail can be seen at many locations. The Kenton Museum tells the history of the town and “No Man’s Land”, Kathy Weiser-Alexander, September, 2008. Kenton, which lies in the Cimarron River valley, is on highway 325 near near Oklahoma/New Mexico border. A small museum in Kenton displays exhibits and history of the area.